Independence Day demands a barbecue, don’t you think? A few weeks ago I saw a recipe for barbecued ribs smoked in a spicy sauce featuring the Korean red chili paste “gochujang.” Gochujang is certainly popular right now—seems like it’s a weekly ingredient in our Blue Apron kits—but we’ve used it a lot over the years because MJ was a Mormon missionary way back when in Korea. Any chance to use gochujang makes MJ happy and since we also celebrate our anniversary this week I decided to build a simple 4th of July barbecue around the ribs. The menu fulfills some basic categories while incorporating flavors from around the world. 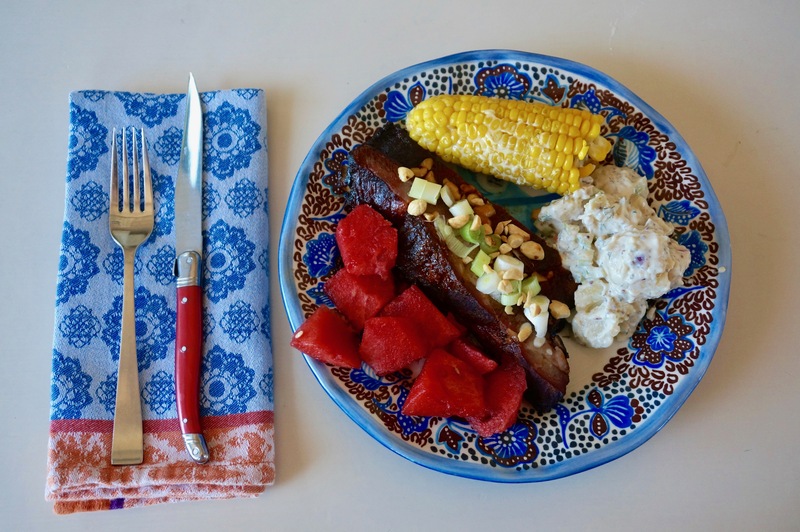 Along with the Korean ribs, it includes potato salad with a German twist, Persian melons, All-American corn-on-the-cob and red, white & blue Italian tiramisu. Or, for those who like chocolate, a globally appealing chocolate cake. Here are the links to the recipes along with some thoughts about each. Gochujang Ribs with Scallions and Peanuts It took the better part of the afternoon to smoke these ribs, but my, were they tasty. Having to stoke the fire through the afternoon added a “slow food” comfort element to the day—the equivalent of having a stew bubbling on the stove in the winter–even if MJ did come to the table smelling like a lumberjack. I especially liked the crunch of the peanuts and scallions. Barefoot Contessa Potato Salad Though this uses a mayonnaise-based dressing for the potato salad, the addition of two types of mustard and dill gave it the flavors of a traditional German potato salad. I like this flavor profile but preferred the mayonnaise verses the usual oil-based dressing for a German potato salad as a counterpoint to the spicy ribs. Made with new potatoes from our Full Belly CSA box, it was dynamite. Mixed Berry Tiramisu I’m not a big fan of traditional coffee-flavored tiramisu—especially for a mid-summer meal. 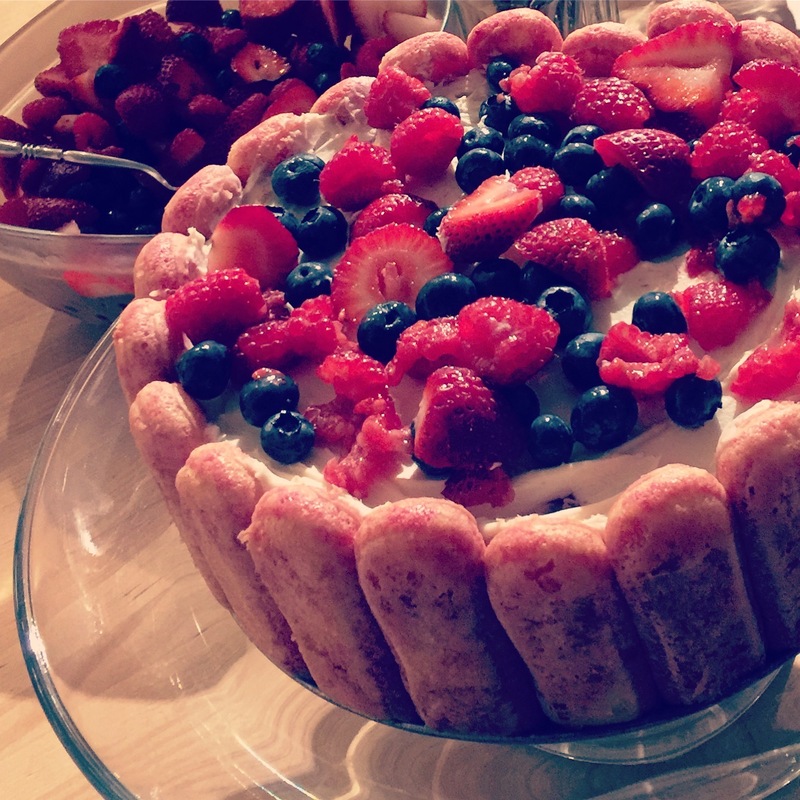 This mixed berry version is both lighter and fits the Independence Day theme. Note that though there’s nothing difficult about the recipe it does take some time to assemble. However, it’s definitely better after sitting for awhile so you can make it the day before. Chocolate Cake with Mocha Frosting I know, I know. I just said I don’t like coffee flavored desserts in the summer (with the exception of Jamoca Almond Fudge ice cream, which is delicious all year round) but the bit of espresso powder and Kahlua added to this chocolate cake recipe does enhance the chocolate flavor. Watch the cake closely at the end, however. It’s easy to overbake and then it’s a little dry. Which can, of course, be remedied with vanilla (or Jamaica Almond Fudge) ice cream. 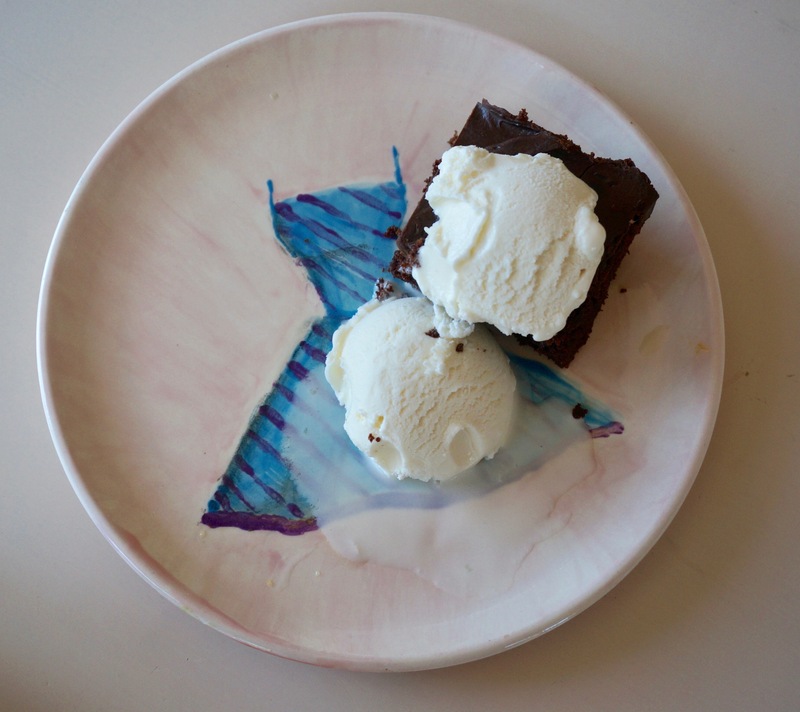 This entry was posted in Sustenance and tagged Barefoot Contessa, chocolate cake, Independence Day, Korean barbecue, New York Times Food, potato salad, recipes, tiramisu. Bookmark the permalink. Post a comment or leave a trackback: Trackback URL.